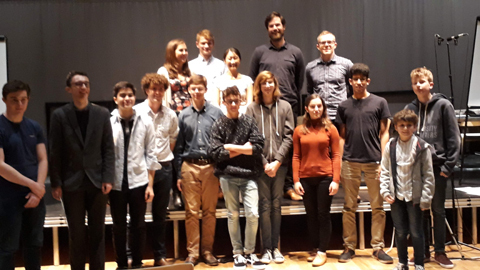 Welcome to Cambridge Youth Music! 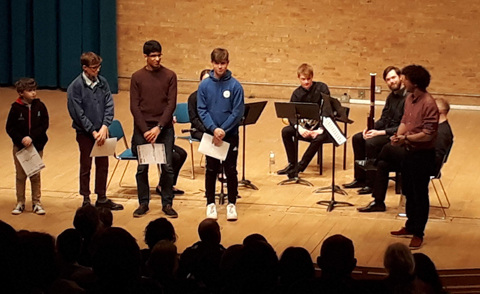 Congratulations to 15-year-old Jacob Fitzgerald of Harston, Cambridge who has won the 2018 East Anglian Young Composer of the Year Competition. Jacob, who attends Sawston Village College, wrote a piece called Upturned for wind quintet. 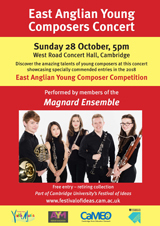 All the pieces, together with a selection of other commended entries, were performed at the East Anglian Young Composers Concert at West Road Concert Hall on 28 October by the Magnard Ensemble. The competition is open to those aged 18 years or under who live or attend school in Cambridgeshire, Essex, Hertfordshire, Norfolk or Suffolk. Individual feedback is provided by judge Ewan Campbell and all entries are performed at the Finals by professional musicians. 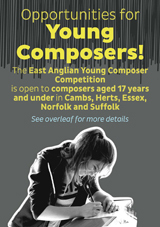 The competition is run by Aldeburgh Young Musicians with support from Cambridge Youth Music. Further details can be found here.